Home office design can be hard to pin down because it’s a place that is meant to be officious yet ergonomic at the same time. Of course you can have both, but blending these two aspects with respect to functionality can be pretty challenging. This is where the furniture comes in. Home office furniture offers a wide variety of selection – each according to style, user-friendliness, aesthetics and pragmatism. From stylistic to simple and even modular, there are a number of furniture choices that you can make for your home office. Let’s take a look at some of these ideas, so you can make a better judgment of what kind of home office furniture you want for your own. If you’re going for a typical layout, then the executive desk is one of the major furniture objects that you’ll be going for. The trendy desk in this image is a great choice for when you want something stylish, yet still imposing and practical. The lightly curvy legs, coupled with the simple tabletop give this desk a very modish aesthetic, which pairs quite well with the blue executive chair that it comes with. 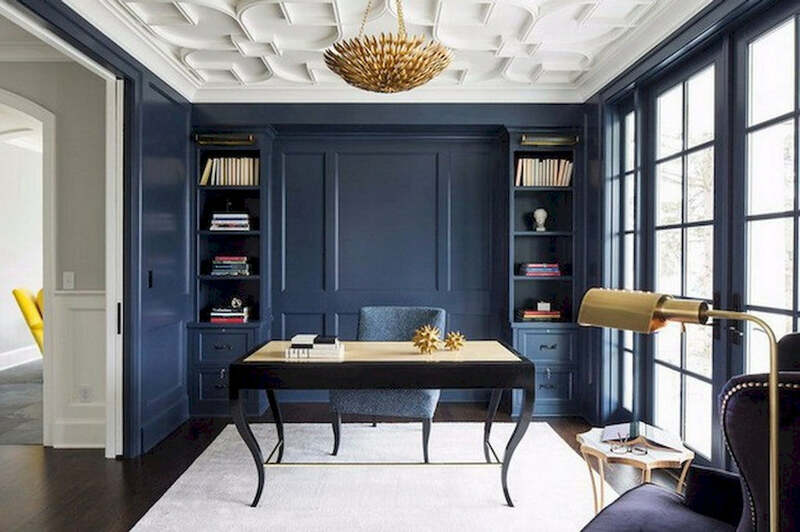 If your home office interior design is more on the fashionable and expressive side, then this is the kind of furniture that you should go for. If you want to fully utilize the space of your home office because your work requires a lot of storage space and paper work, then this is the kind of furniture that you should opt for. U-shaped layouts with in-built cabinets and shelves can provide an ample amount of room for all sorts of storage and stationary. You can customize the design of these shelves according to the kind of aesthetic you’re going for. You can also control the size of each shelf so that it will easily accommodate your office files and other paraphernalia. It’s one of the most ergonomic home office furniture types that you can go for. L-shaped home office layouts are usually designed to fully utilize unusable corners, alcoves and crannies. This kind of an office layout also calls for come customization. Because most of the furniture is basically in-built, you can easily control the size of shelving, cabinets and drawers according to the kind of work you do. You can easily maximize the work-surfaces if you’re a designer, or you can increase the storage if you’re an accountant. This kind of office furniture usually works best in homes where the space is short, and instead of an entire home office, you only have a small alcove to work with. This is the infamous Jennifer Aniston home office. The classy vintage look is highly inspiring and stylish. 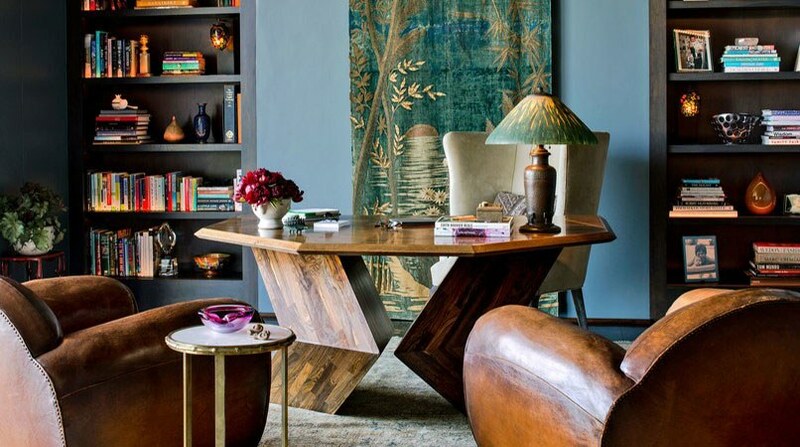 The oversized furniture is the perfect accompaniment to the studious ambiance of the backdrop. The huge desk with bent legs acts both in a decorative as well as a functional capacity, while the chair is definitely oversized to emphasize a position of power. Feminine and empowering all at once, this kind of office furniture is perfect for those who wish to seem imposing and intimidating at once. Modular home office furniture is another great idea for those who’re on a budget, but want to have something stylish and pragmatic at the same time. This office furniture set is very modish yet practical. The desk has enough storage space to be handy, while the tall units that come with can be used for both decorative as well as functional purposes. The whole thing is very lightweight, and would make your home office look spacious and delicate. Moreover, you can easily adjust every part to suit your spatial layout to the fullest. For those who are inspired by the sleek austerity of modernism, this ultra-modern executive furniture set would be absolutely perfect. The combination of chrome and slick wood creates a contrasting aesthetic that is complemented by the leather upholstery of the seats. The whole set looks very officious and intimidating in a cool, elegant way. The beauty of this kind of home office furniture would definitely be elevated ten-fold within a total contemporary style interior design. 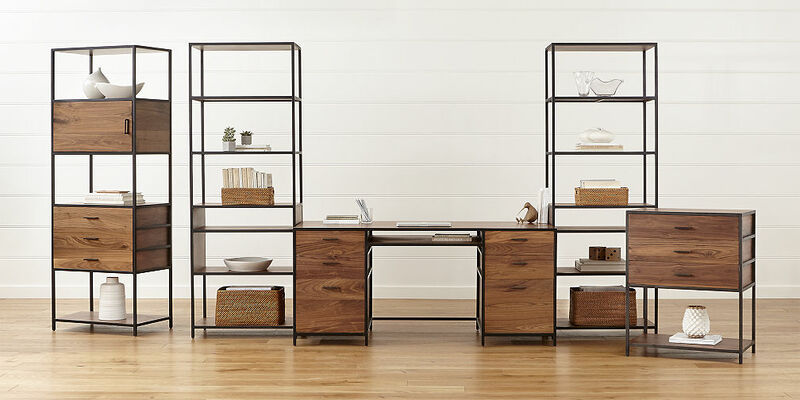 No home office would ever look complete without proper shelving and storage. The feature shelving unit in this image is a great example of how you can feature your essentials while still hide some of the important stuff in style. The whole unit is in-built and can easily be customized according to the size and dimensions of one’s office space. Office chairs are one of the most underrated parts of selecting the furniture. Most people tend to ignore it in lieu of the desk or cabinets. However, this beautiful cream colored chair would be the perfect furnishing for a stylish home office. It’s plush, comfortable and highly trendy. The tufted back, coupled with the beautiful upholstery makes for an interesting and intimidating combination. 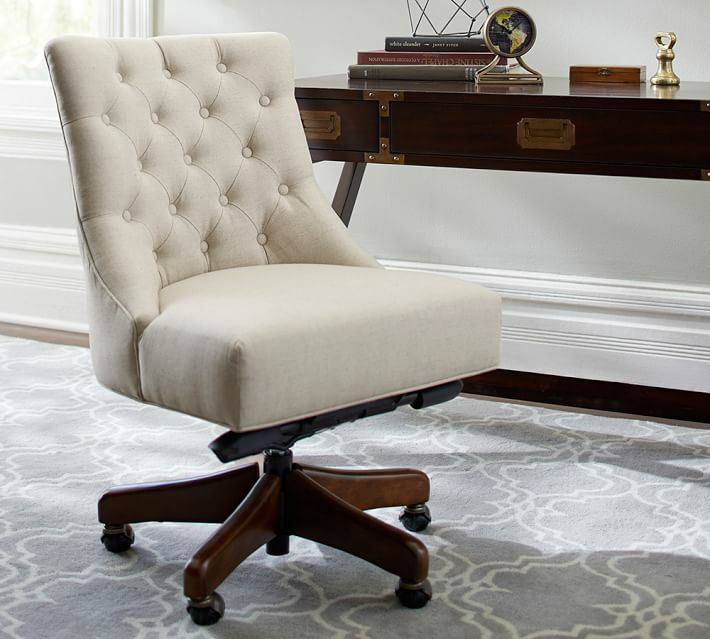 It’s the perfect chair to have in a stylish, effeminate home office. These are some of the most interesting home office furniture designs that you can take inspiration from. They range a gamut of different genres and categories, and you can select one according to the size of your space, or the kind of interior design you’re going for.